Tips and Tricks : Give your old furniture and other items a new breath of life! The sixth idea is perfect for cooking! Have you accumulated a lot of things in your house or garage? Do you have old tools lying around? Do you have old tires? Do you have old dishes lying around in the cabinets and are not sure what to do with them? Today we offer you all kinds of ideas for recycling these objects that hang around the house that we don't always know what to do with! Do you have worn tire rims? Place the rim on the side and you get an instant outdoor fireplace. Surround it with bricks to protect your hands and feet from the hot steel. We often accumulate all kinds of keys in our drawers. Bend your keys to make small hooks that can be set up all around the house! Your garage may contain several pieces of plumbing. With a little rust-proofing and lots of imagination, you can turn your old hardware and plumbing into a steampunk game of chess. Do you have mismatched bowls and cups in your cupboard? 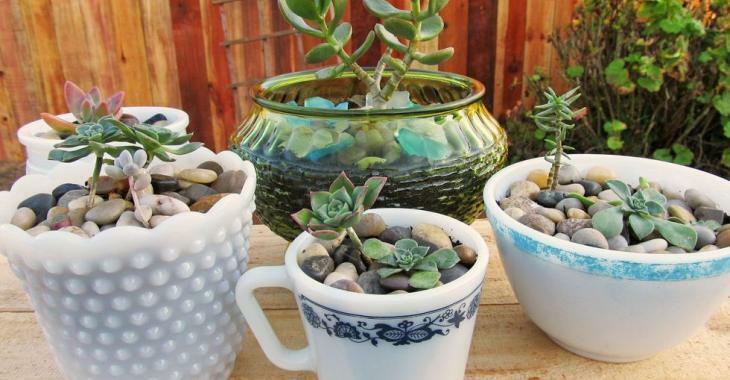 What do you say about using them to plant small and succulent plants? We all have an old piece of furniture that once held our big cathode-ray television. See what this old piece of furniture has become! I myself have a cabinet like this at home and I do not know what to do with it anymore! Add fresh paint, rollers, a butcher's block and a bar to hang utensils and you get the perfect cart or kitchen island. We all have old doors lying in the basement of the house or in the garage. Why not transform the door and place it somewhere in the house? Do you have an old metal bin? See how it has been transformed into a charming little side table! We all tend to collect a large number of old coffee containers. Yes, of course, we can put them in the recycling but they can also be useful in the garage! There is a myriad of uses for old tires (just be sure to clean them carefully otherwise you will end up with dirt everywhere). This is an original way to recycle a tire! Cheese graters wear and rust, but that does not have to be the end of their useful life. Recycle the old cheese graters to make chandeliers! A wood pallet is not a usual household item but you can do so much with it! Pallets have many uses, so why not turn one into a fun object, like this cooler stand? This rake has seen better days, but it is still useful. Attach an old steel rake to the wall and use it to hang kitchen utensils. Seamstress rules are useful for many things! They can be used to create simple crates for storing supplies and craft tools. We are talking here about an extreme transformation! This IKEA furniture has been completely transformed! It looks like antique furniture now! That's how to give a second life to your objects and furniture!